D. linearilobum (Trautv.) Busch in Fl. Cauc. Crit. 3(3): 68 (1902). Syn: D. speciosum Bieb. var. linearilobum Trautv. in Acta Hort. Petrop. 4(1): 102 (1876)! D. speciosum sensu Boiss., Fl. Or. 1: 93 (1867), quoad pl. anatol., non Bieb. Ic: Grossheim, Fl. Kavk. ed. 2, 4: t. 3 (1950). Many-stemmed perennial, 30-100 cm, densely crisped-pubescent, even canes-cent. Leaves deeply palmatifid, segments deeply lobed and incised into shortly lanceolate or linear-lanceolate divisions, middle segment 3-20 mm broad at base. Raceme linear-oblong, c. 5 cm broad. Bracts and bracteoles linear, or the lower bracts tripartite. 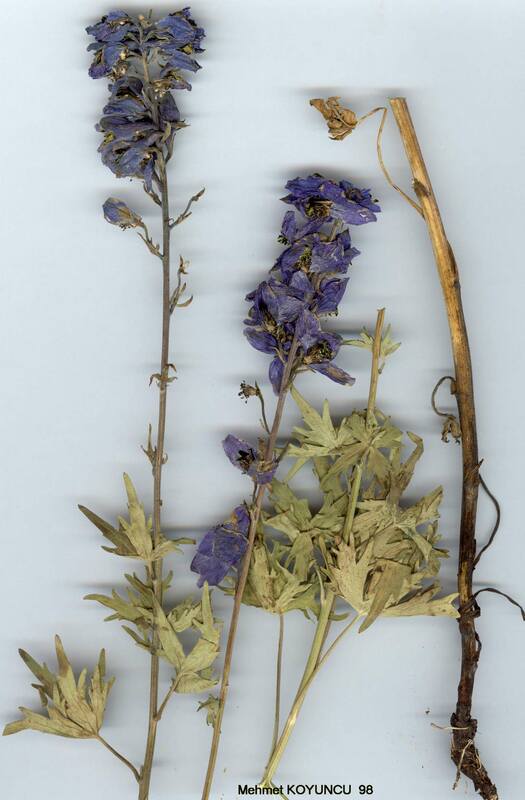 Flowers 2.5-3 cm long, violet-blue; sepals ovate, crisped pubescent outside, pilose within; petals greyish black, the lower pair with yellow hairs; spur a little shorter to half as long as sepals, horizontal, attenuated, incurved towards tip. Follicles tomentose. Fl. 7-8(-9). Rocky igneous slopes and gulleys, often by streams, 2100-2750 m.
Type: [U.S.S.R.] Transcaucasia rossica, d. Achalzich, ad lacum Chosapin, 1800 m, Radde (holo. LE!). Mountains of E. Anatolia. A7 Gümüşane: Tempede, Sint. 7107! A9 Kars: W foot of Kisir Da., 2100 m, D. 32562 p.p. (with D. buschianum)! B7 Erzincan: Keşiş Da. above Cimin, 2500-2600 m, D. 31665! B9 Van: d. Hoşap, Kepir Da., 2700 m, D. 23612! Soviet Armenia, Georgia, W. (& NW?) Iran. Ir.-Tur. element. The Turkish plant was referred by Boissier to D. speciosum Bieb., a species confined to the Caucasus. D. linearilobum differs in its short crisped pubescence, more attenuated laciniae, narrow bracts and bracteoles, and smaller flowers. It varies considerably in leaf dissection, every transition being found between the type with almost linear laciniae to more broadly lanceolate divisions. There is also striking variation in the length of petioles and internodes. 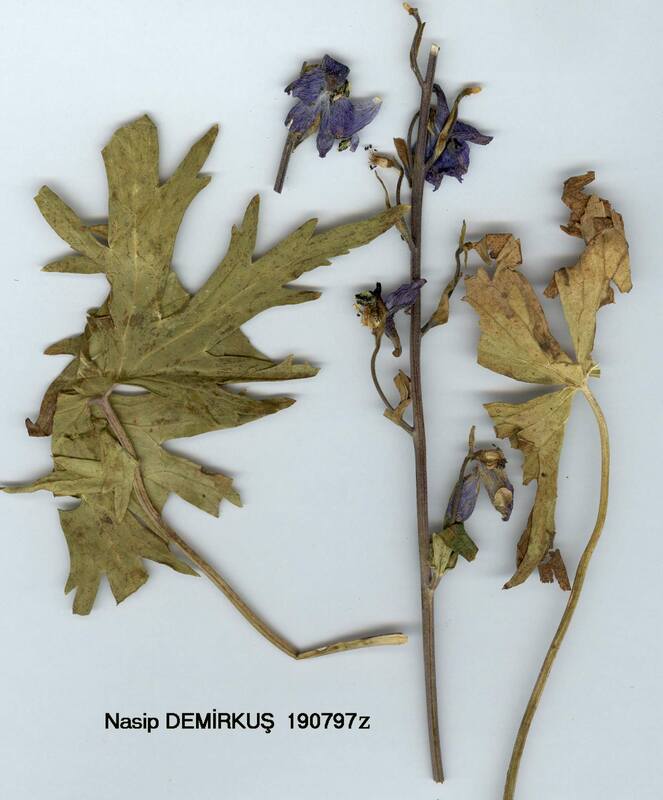 D. linearilobum is closely allied to two species from Daghestan, D. tomentellum Busch and D. crispulum Busch.